Biological control of ticks or mites means controlling them with natural organisms that are their natural enemies. Predators: they just eat the ticks, either those still attached to the host, or engorged females that have dropped to the ground: mainly birds, ants and a few mite species. Parasitoids: these are wasps that deposit their eggs on ticks. The larvae of the wasps feed on the tissues of the ticks that are ultimately killed. They can be considered as "parasites" of the ticks. Pathogens: mainly bacteria, fungi and nematodes (roundworms) that infect and kill the ticks or mites or their larvae. They can be considered as "diseases" of the parasites. So far there are no biological control methods against ticks and mites of dogs and cats. Click here to learn more about general aspects of biological control of parasites of livestock and pets. Numerous birds feed on ticks. 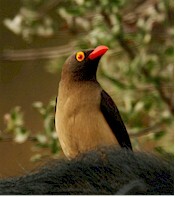 Best-known diligent tick feeders are cattle egrets (Bubulcus ibis), oxpeckers (Buphagus spp. in Africa) and cattle tyrants (Machetornis rixosa, in America). But other chicken, guinea fowls and many other domestic and wild birds eat ticks as well. There are numerous studies investigating tick consumption of several bird species. Studying the stomach content of oxpeckers it was found that they actually eat large amounts of ticks, but on if they lived in contact with animals heavily infected with ticks. This means that they are not specific tick feeders, but eat what is available, as all investigated birds. For these reason they cannot be used for the purpose of biological control of ticks. Several studies have shown that various ant species predate on eggs and larvae of ticks and other arthropods, particularly Pheidole megacephala (bigheaded ant in the US, coastal brown ant in Australia), Solenopsis spp (fireants) and Camponotus spp (carpenter ants). It has been found in the USA that pastures with abundant ant colonies have fewer ticks than those with srarce ant colonies. And if ticks are released on such pastures, they are not found afterwards because the ants eat them. 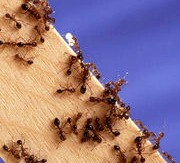 But regarding their feeding behavior ants behave like birds: they eat what is available, i.e. they are not specific tick feeders. There are also studies that show that formic acid released by the ants has a repellent effect on ticks. Rabbits kept on ant-rich pastures carried fewer ticks than rabbits kept on ant-poor pastures. For these and other ecologic reasons it is not a good idea to try to eliminate ants from pastures using insecticides, unless they are excessively annoying as is the case for fire ants. Summarizing, although ants can certainly contribute to eliminate some ticks on pastures, usually it is not enough to bring the tick populations below the economic threshold level. Anystis baccarum is a mite species that predates on other mites and is used as a biological control weapon in crop protection. It also predates on tick larvae, particularly those that climb onto shrubs or grass blades questing for potential hosts. But results of trials run in Australia with these mites to control cattle ticks were disappointing. All parasitoid species of ticks are small hymenopteran wasps of the genus Ixodiphagus, particularly Ixodiphagus hookeri. Some studies on the potential of these wasps for controlling ticks have been run in the US against Ixodes scapularis and other ticks that are vectors of human borreliosis. Ixodiphagus wasps are very efficient parasites of ticks that achieve 25 to 50% natural parasitization rates. Preferred hosts were found to be engorged larvae. Each wasp deposits 6 or more eggs inside an engorged tick. It was also calculated that 300'000 wasps have to be released per km2 to achieve a parasitization rate of 95%. This would massively reduce the tick populations after one year. Production cost of the wasps was estimated to be 1 USD/1000 wasps, i.e. 300 USD per km2 treated. Unfortunately field trials in the USA failed to really control the tick populations. Field studies in Kenya showed a parasitization rate of about 50% against Amblyomma variegatum, but no parasitization at all against Rhipicephalus appendiculatus. There are also studies in Brazil on Amblyomma cajennense and Rhipicephalus sanguineus. To our knowledge Ixodiphagus wasps are not yet commercially available in most countries where ticks are a problem for livestock. Bacillus thuringiensis Berliner (Bt), a particular strain of Bt produces a thuringiensin, a toxin that destroys the gut cells of ticks that ingest it. Bacteria themselves are also pathogenic for numerous arthropod species. Most commercial products used against crop pests are a mixture of the toxin and bacterial spores. If the arthropods or their larvae eat the spores or come otherwise in contact with them the bacteria will multiply in their organism and kill them within a few days. There are numerous commercial products based on Bt, mainly for crop protection and for large-area mosquito control, but also for controlling other insects that develop in water, (e.g. black flies, midges, etc). Such products contain basically Bt spores. If the flies or their larvae eat the spores or come otherwise in contact with them the bacteria will multiply in their organism and kill them within a few days. Ticks have to ingest bacteria or their toxin to be killed. But this is very difficult to achieve because ticks are bloodsuckers and do not eat anything else, neither the stages on the animals, nor the free-living stages (larvae, nymphs, etc). 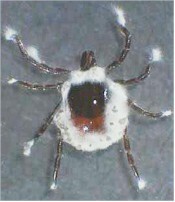 Nevertheless, laboratory studies have shown that several tick species (Argas persicus, Boophilus annulatus, etc.) immersed in Bt suspensions showed considerably mortalities and a significant reduction of egg hatching. There are also reports of a good efficacy of thuringiensin suspensions against northern fowl mites when directly applied on infested chicken. However, to our knowledge there are still no commercial products based on Bacillus thuringiensis approved for use on livestock or pets. The use of pathogenic fungi against crop and livestock pests has been intensively investigated. 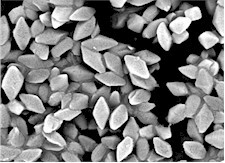 There are already numerous commercial products containing spores of these fungi that are used against crop pests. There use against livestock pests is much less developed and little is known so far on their field efficacy against ticks and mites that affect livestock and/or pets. When the spores of these fungi come in contact with the ticks or insects they stick to their cuticle, where they germinate and produce hyphae, thread-like filamentous structures. These hyphae diffrentiate into appressoria, structures capable of penetrating into the host's body, which they often do by piercing the membranes between the body or limb segments, or through the mouth pieces. Once inside the host's body they proliferate in the body cavity (=hemocoel) irreversibly damaging the body organs and ultimately killing the host within a few days. Some of these fungi produce also toxins. The best investigated species of fungi pathogenic for ticks belong to the genera Beauveria, Metarhizium, Paecilomyces and Verticillium. Most species parasitize both insects and ticks, develop in the soil and are found worldwide. Four species have been particularly investigated regarding their efficacy against livestock ticks: Metarhizium flavoviridae, Metarhizium anisopliae, Beauveria bassiana and Verticillium lecanii. Laboratory trials showed up to 100% mortality of cattle ticks two weeks after treatment, but without completely suppressing oviposition of engorged females. High mortality (50% to 90%) was also achieved against other tick species (e.g. Amblyomma spp, Rhipicephalus spp). Excellent laboratory results have been obtained against sheep scab mites (Psoroptes ovis) and fowl mites (Ornithonyssus spp, Dermanyssus spp) as well. Unfortunately these promising results are difficult to reproduce under field conditions. It is relatively easy to produce large amounts of spores of these fungi and they can be usually administered to livestock in the form of water or oil suspensions using the same spraying equipment that is used for classic pesticides. Distribution logistics of such products is also relatively easy because they do not require a cold chain or other usual precautions for biological materials. But when sprayed onto animals, the high concentration of spores required might result in too viscous suspensions that clog the standard application equipment. And at such high concentrations it is difficult to keep the spores suspended in the carrier liquid. Such complications may lead to inadequate administration in the field trials that explain their failure. Other factors can explain the difficulties found to reproduce the laboratory results under field conditions. It seems that efficacy strongly depends on the body temperature of the ticks, which is usually 26°-28°C in the laboratory, but 34°-37°C in the field. It is known that fungal vitality peaks at about 30°C and diminishes quickly at higher or lower temperatures. Changing climatic conditions in the field can also negatively impact fungal development: cold weather may slow down germination of fungal spores, heavy rains may wash the spores away, excessive sunlight can kill a certain number of spores, etc. There are also studies on the effect of fungal spores directly applied to tick infested pastures around places where livestock congregates (shade trees, salt licks, drinking troughs), where the density of tick eggs, larvae and nymphs is likely to be high. It was shown that populations of cattle ticks could be reduced but not eliminated. But such treatments can also be detrimental for the beneficial fauna on the pastures. Numerous helminth species that are pathogenic for insects and ticks are already used in commercial products against crop pests. They are called entomopathogenic worms. The best-known genera are Steinermena and Heterorhabditis. These roundworms penetrate into the insect body where they release symbiotic bacteria that they carry inside. These bacteria multiply inside the insect, and kill it in a few days. The decaying tissues serve as nutrients for both worms and bacteria. Promising results have been achieved in laboratory studies with Steinermena carpocapsae against Boophilus annulatus. Other nematodes showed efficacy against Amblyomma and Rhipicephalus ticks, but not against cattle ticks, Rhipicephalus (=Boophilus) microplus. Unfortunately very few field trials have been conducted with these nematodes against ticks. Preliminary studies indicate that the type of soil plays a decisive role in the efficacy, as well as the body temperature of the ticks. Efficacy is highest between 22°C and 26°C and drops strongly below 18°C and over 30°C. An additional difficulty for the use of such nematodes in the field is the fact that most tick species are not viable hosts for the worms, i.e. the worms do not complete their life cycle on the ticks. This means that pastures would need to be treated periodically to maintain a high density of infective worms. But very little is known about survival conditions of the worms on pastures, the influence of climatic conditions on worm survival and dissemination, etc. Summarizing, a lot of research is still needed until reliable products based on these nematodes become commercially available for the control of ticks or mites of veterinary importance.